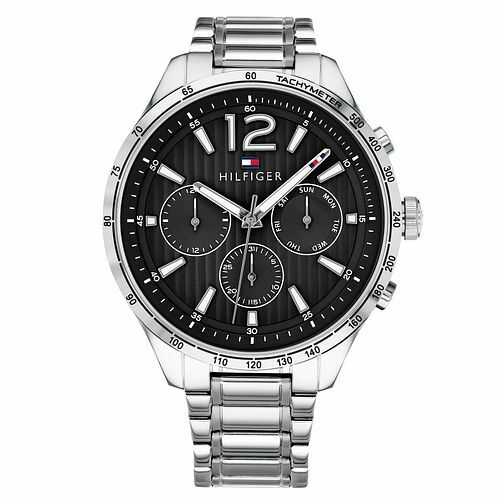 This casual men's sports watch by Tommy Hilfiger features a stainless steel bracelet and 46mm case with a black multi-eye dial. The dial is complete with day and date and the signature Tommy flag logo at 12. It is water resistant to 5 ATM and comes with a 2 year international warranty. Tommy Hilfiger Men's Stainless Steel Bracelet Watch is rated 5.0 out of 5 by 3. Rated 5 out of 5 by Anonymous from Lovely gift Very stylish watch. Bought for my boyfriend for his 28th Birthday, he was very happy with it!